Sometimes, when you’ve been crafting for a while, you take the techniques you learned along the way for granted. 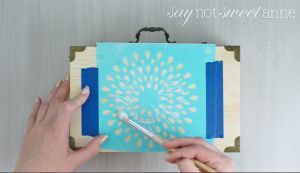 There are ideas, recipes, ways of doing things (like this watercolor stenciled box) that come so naturally you assume others know them too. This home-made watercolor wash using a clear mod podge to resist the paint has been one of my favorites for years. I love the batique like finish, how easy it is, and how colorful it can be. Recently I was reminded that not everyone has heard of such a thing, and was asked to share how I accomplished the look. Well, I did more than share! 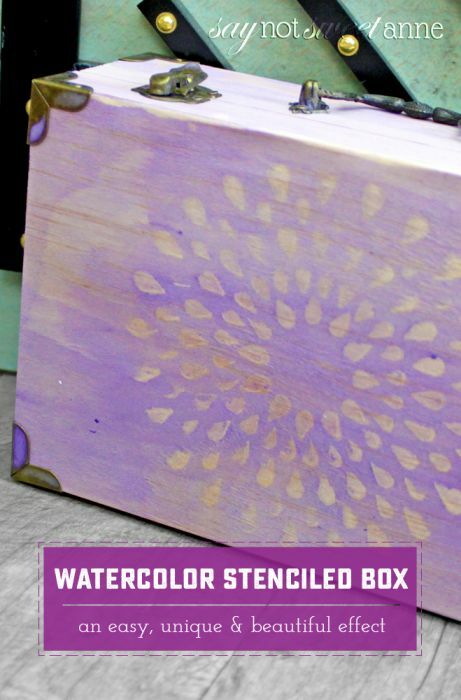 You can see in my very first every tutorial video below just how to achieve this Watercolor Stenciled Box technique. It comes together in no time at all (and that’s not just because of the high speed!) but the results can be really breathtaking. As most tried-and-true techniques go, this can be applied to any number of surfaces, with any number of stencil patterns, in any number of ways! 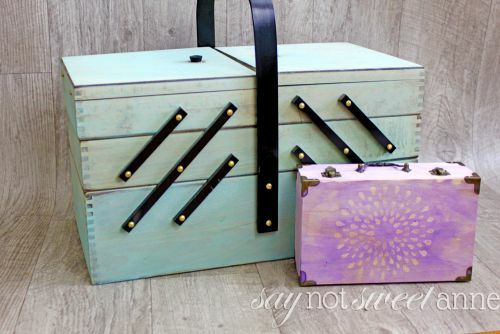 Use the stencil to guide you while you paint the unfinished wood with a tin coat of mod podge. It will dry clear. 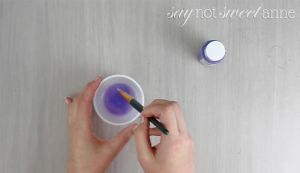 Mix a small amount of paint with water until you get a watercolor like consistency. Aim for too much water rather than too little. If your wash has too much paint it will cover up your mod podge! Paint the box with you wash, if you’d like it to be darker, apply multiple coats. Let dry! That’s it folks. It really is easy. Here you can see it in 45 seconds FLAT!